A complete solution from the valve Up! Our gear overrides enable users to safely and easily position their valves - specifically enabling a 90 degree turn in either direction. UniTorq's direct NAMUR solenoid valve provides high-cycle, high-flow, fast-response performance in the most severe environments. Equipped with a standard manual override, UniTorq solenoids provide most standard coil voltages. UniTorq's portfolio of advanced-control positioners offer a consistently reliable solution with proven durability. The UT-SC accurately and consistently adjusts the rotary speed of the actuator for precise control of the open/close speed of the valve. 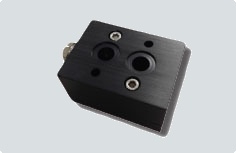 The UT-AL air lock "block and vent" device blocks the supply of air from both the solenoid valve and the actuator while it vents all compressed air. The UT-PV purge valve is a rebreathing block that provides a quick exhaust function that increases the fail position speed of spring return actuators. UniTorq offers a wide range of mounting accessories for special applications. We can also assist in a custom solution.